Stainless steel countertop lid dispenser with adjustable dividers for multiple size lids. Tomlinson COUNTERTOP ADJUSTABLE LID DISPENSERS offer a paradigm shift with its designing perfection. 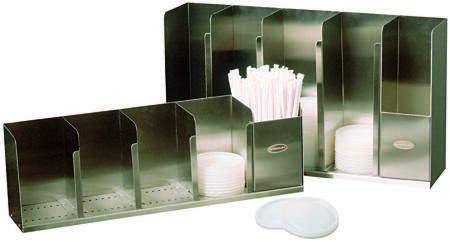 These dispensers are a perfect solution when you need to serve a variety of lids at once. Integrated adjustable dividers provide exceptional control of storing and dispensing various sized lids within one unit. Keep lids organized along with spick and span countertops by integrating smart Tomlinson solutions. In fact, adding a condiment dispenser along with the lid dispenser adds extra vibe to hospitality and customer service. Get your Tomlinson Countertop Adjustable Lid Dispensers today for lasting performance. In fact, you will be amazed with the broad choices of applications as well as mounting styles.